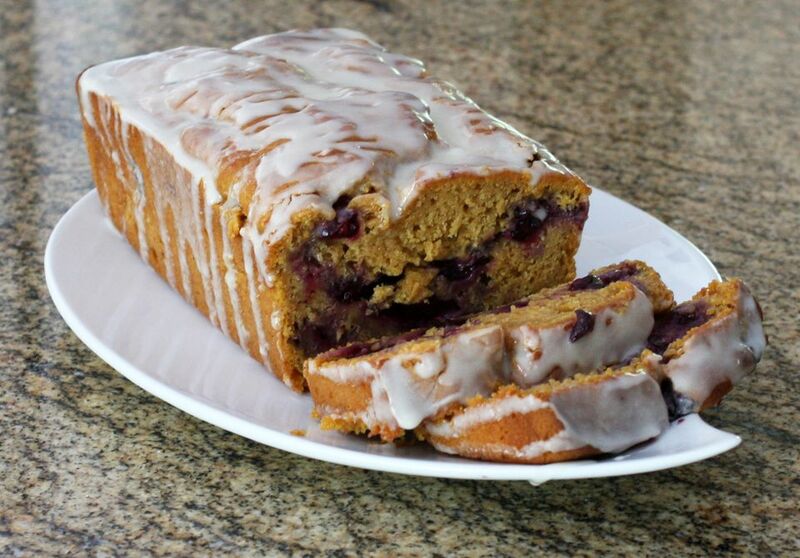 This blueberry sweet potato bread is a nicely spiced quick bread, perfect for a snack or a special breakfast or brunch. The bread is really very easy to prepare and bake and the vanilla icing gives it extra flavor. I like this bread as a coffee cake. It also freezes very well, making it a nice bread to have in the freezer for unexpected guests or visitors. With frozen summer blueberries and fall sweet potatoes, this bread is perfect for just about any time of the year. Heat the oven to 350 F. Grease and lightly flour an 8 1/2-by-4 1/2-inch loaf pan or spray with baking spray. In a mixing bowl with an electric mixer on low speed, combine the mashed sweet potato, brown sugar, orange juice, eggs, and melted butter. Beat until smooth and well blended, about 1 minute. In another bowl, combine the flour, baking powder, salt, and spices; blend well. Add the flour mixture to the pumpkin mixture. Beat on low speed just until combined. Spoon about one-third of the batter into the prepared loaf pan. Fold the frozen blueberries into the remaining batter. Spread the batter over the plain layer in the loaf pan. Bake for about 55 to 60 minutes, or until a toothpick or cake tester inserted into the center of the loaf comes out clean. Turn loaf out onto the rack and cool completely. In a bowl, combine the vanilla icing ingredients, adding about 1 1/2 tablespoons of milk. Add more milk in small amounts, whisking until you get a good drizzling consistency. Drizzle the icing over the sweet potato bread. Store the sweet potato bread in the refrigerator for 3 to 4 days or freeze it for up to 1 month.